I thought I’m getting crazy with the above meaningless error message. I tried to create an Enterprise Search Center within a site collection in SharePoint 2010. But I’ve received this error message all the time. I’ve also tried to create a new site collection, but without success. Suddenly I had the idea to try it with SharePoint Designer. And voila, I’ve got an error message I can work with. Love the SharePoint designer trick … Gonna use that in the future. Great stuff! This morning’s stress has been lifted thanks to this solution! Helped me out a lot. Appreciate it. Keep posting more stuff. Great site. A lot of useful information here. IÔÇÖm sending it to some friends! 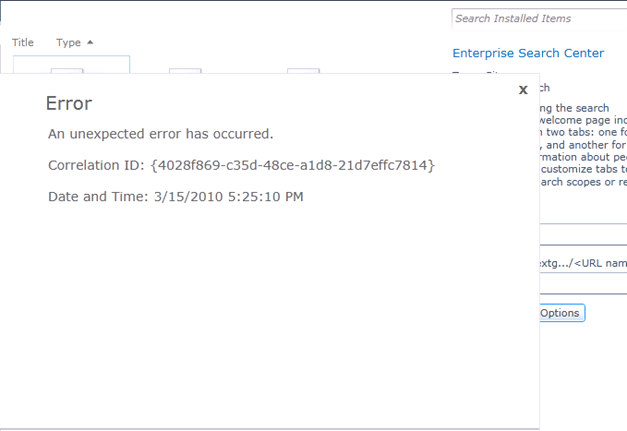 Great site thanks for sharing – how did you open the error message page in sharepoint designer? Within SharePoint Designer just use “Open Site” to open one. Afterwards you can create almost everything there, for example new subsites. I started getting this error after I installed SP Designer and tried to modify a master page using it. Oh My GOD thanks man I dont know if to cry or just go home early. Excellent solution , saved my day. The error message is really dumb and i bet without your help I would have been moving in circles.